I can't stop using these colors! This time I added a neutral, black. I had a few left over roses and leaves from my first card so I created a second one. I used the chicken wire background stamp from the PTI set Background Basics: Farm And Barn, and a decorative scroll stamp from the PTI set Mat Stack 5 collection. I hope you like it, and I'm happy you stopped by! Have a wonderful day! 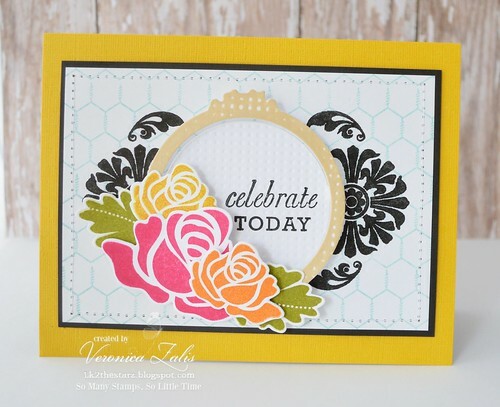 Love the card and color combo, and the chicken wire in the background is such a nice touch! Beautiful, need to break out the fun ink colors.